Published by Mountainblog on 05/22/2014 . Occam’s Razor is a frontside carving machine featuring SkiLogik’s Race Room construction that provides the ultimate in technical, performance-based ski making. The torsional rigidity, power, and stability of SkiLogik’s Race Room combine in an 11.5 meter radius so you can lay down high angle carves on any surface from bulletproof to soft pack. The profile on Occam’s Razor is engineered to allow the skier to weight-load through a sustained high energy carve without any disruption of edge penetration. This is the ski to get if you’re looking to hang out on the edge. SKILOGIK is a Colorado-based brand pioneering Extreme Ski Making, utilizing unusual amounts of engineering, craftsmanship, and expensive materials. Each pair is made individually and only ten pairs or less are produced per day in its Custom Lab. 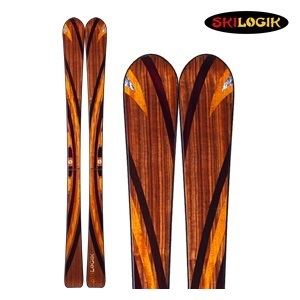 SKILOGIK has been winning performance tests including Real Skier’s 2011 Ski of the Year. SKILOGIK is also known for its environmentalism and social responsibility. 95% of the wood used in making the company’s skis is sustainably harvested. For each pair produced, SKILOGIK makes a donation to the Nature Conservancy to have a tree planted in a reclaimed rainforest.